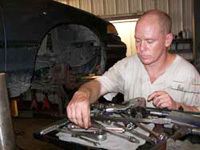 Delaware Correctional Industries garage operation is conducted from James T. Vaughn Correctional Center. Future plans are to have multiple shops throughout the state. In testimony of DCI's success, the OMB Fleet Services Director has stated that, were it possible, he would direct all of the state's vehicle repairs to the DCI's garages. Many of the DCI motor pool staff and inmate workers are ASE (Automotive Service Excellence) certified in the various areas of automotive repair and diagnostics. This certification will provide the inmate with the proper credentials to successfully acquire a job in the automotive repair field upon completion of his sentence. Motor Pool services are only offered to Government Agency Vehicles at this time.